Koreans have a proverb that says, "when whales fight the shrimp's back gets broken." Of course, it refers to the location of the Korean peninsula, sandwiched between two larger countries and economies. At least in the ICT sector, the Japanese "whale" has become much less of a threat to Korea, as pointed out in a post on the Barron's Asia blog entitled "In technology, China is a bigger threat to Korea than Japan is." The post draws heavily on the analysis of Nomura Securities strategist Michael Na, who notes "We think the level of Korean tech players’ direct competition vs Japanese players has declined significantly, as opposed to in the past. This is mainly because many Japanese tech companies have exited from those IT products (ie, TV/display, smartphones, DRAM) in which Korean players have a competitive edge, or have seen their market positions deteriorate substantially. The market circumstances have changed such that Japanese players now primarily supply IT components, materials, and equipment to Korean tech players." Furthermore, Na observes that "We see a much higher degree of direct competition between Korean and Chinese companies. Chinese tech firms have already experienced significant growth, especially in set products (ie, TV, smartphones), by taking advantage of: 1) large-scale domestic demand in China; and 2) the fact that Chinese players are not regulated for IP (intellectual patent) issues." In this situation, Korea finds itself struggling to "inch up the value chain," as the Barron's post puts it. Put otherwise, the big hurdle or challenge facing Korea is to shift its emphasis away from hardware manufacturing and exports and toward software, content and services. This challenge is also at the heart of the creative economy initiative in Korea and involves the shift from a domestic to a global mindset. I'm thinking that we'll see interesting progress toward meeting this challenge in 2015! My research with Korean colleagues documents the manner in which this nation rose from the ashes of the Korean war and, beginning around 1980, harnessed the digital network revolution for national socioeconomic development. However, it did not accomplish such remarkably rapid development on the strength of technology alone. The number one success factor for Korea was its dedication to and investment in education. There are many indicators of that sustained commitment to education, but today one of the most important is research and development. South Korea now leads the world in R&D intensity, a measure of gross investment in R&D as a percentage of gross national product. 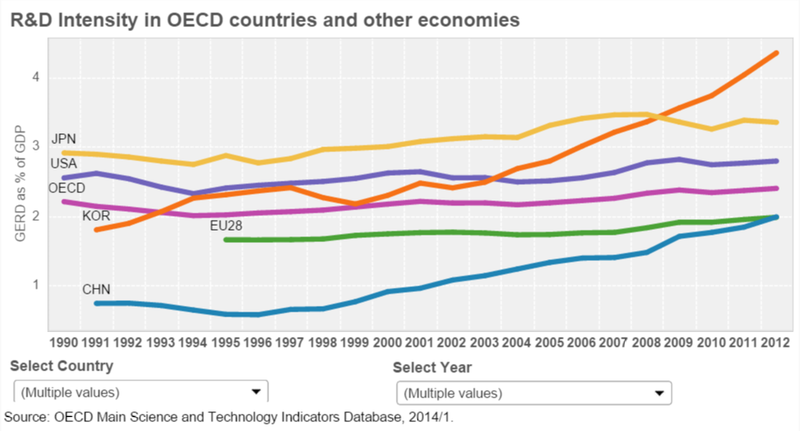 As shown in the accompanying chart (click to see a full-size version) from the OECD, this nation's rise began shortly after the turn of the millenium. My point is simply that this sort of government-led planning has paid dividends for Korea in the past. If overall levels of investment in R&D produce the expected results, then the outlook for this nation in 2015 and beyond looks bright. The announcement that SK Telecom has launched a portable air quality monitoring device with an associated smart phone app caught my eye this morning. 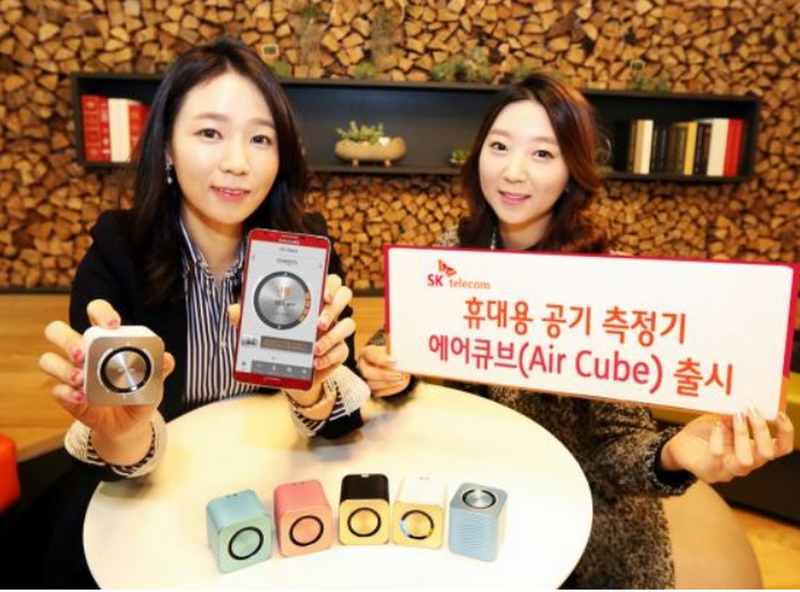 According to Koreabizwire, "Designed to enhance people’s health and well-being, Air Cube monitors the air quality of the surrounding environment to determine if the conditions are just right for users. Air Cube comes in two different models: Air Cube C measures the level of fine dust particles and carbon dioxide, while Air Cube T offers fine dust level and discomfort index (by measuring temperature and humidity). The air quality is measured every 15 seconds and the results are shown in five levels. When the air contamination/pollution reaches or exceeds level four, the device makes an alarm sound to warn users." Similar devices have been launched in the U.S. and in China, with the latest ones being small wearable devices. Wired reported recently on a wearable device developed in China and shown in the accompanying graphic (click for full size version). As noted in the Wired article, "Earlier this year, Beijing’s concentration of PM 2.5 particles—those fine enough to penetrate the lungs and enter the bloodstream—reached 505 micrograms per cubic meter, and the World Health Organization recommends a safe level of 25. Forty percent of global air pollution-related deaths—1.2 million in total—have been linked to PM-2.5 pollution in China, according a 2013 WHO report. This means it’s vitally important that the Chinese keep a close eye on the quality of the air around them. But reliable data can be difficult to come by. Just last week, when several major heads of state met for an important regional summit in Beijing, the government reportedly blocked air pollution data provided by the U.S. Embassy from being displayed on local smartphone apps and websites. clarity-inline2 Screenshot: courtesy Clarity It’s no small problem, and David Lu aims to solve it. Together with seven other students at the University of California, Berkeley, Lu recently created a new kind of air pollution sensor dubbed Clarity. 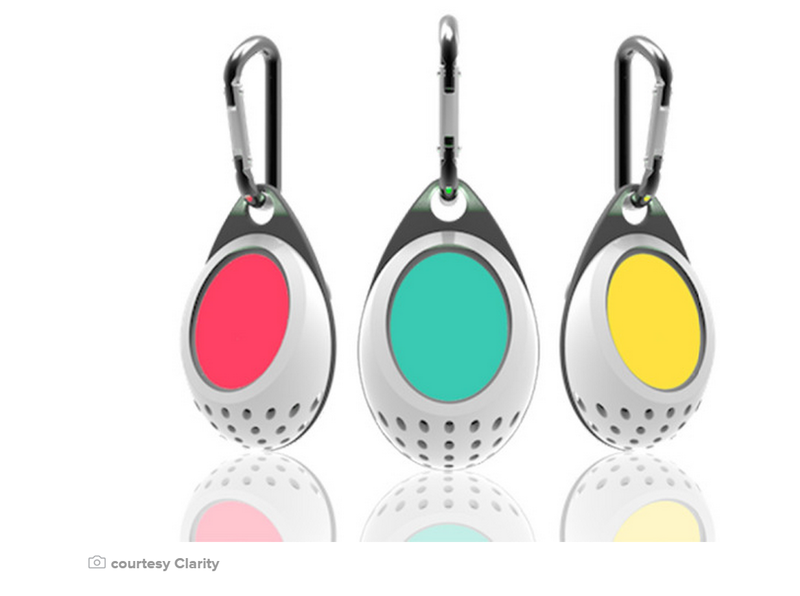 This keychain-sized gadget lets you constantly track your personal exposure to air pollution via a smartphone app. But it’s also a way of crowdsourcing much broader studies on air quality—not only across China but throughout other parts of the world as well." 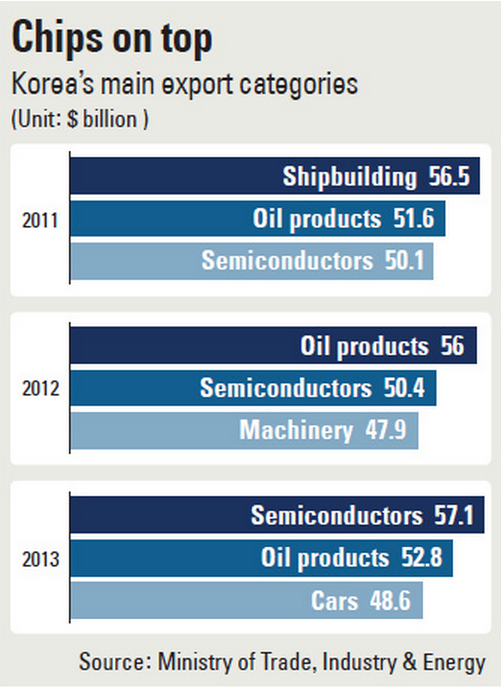 As reported by The Joongang Daily this morning and shown in the accompanying graphic (click for a full size version), semiconductors continued to be South Korea's top export item in 2014. About a quarter of a century ago, in 1980, this would have been unthinkable. At that time, despite efforts by the government of President Park Chung Hee in the late 1970s to boost the industry, this nation could not compete in the global market with the dominant U.S. and Japanese firms. However, in 1980 and early 1981 a small group of U.S. trained technocrats from government, industry and academia wrote a remarkable document called the "Long term plan to invigorate the electronics sector." It targeted the semiconductor industry, electronic switching for telecommunications, and computers and outlined a plan that envisioned what today is called the ICT sector. As noted in The Joongang Daily,"The semiconductor business is now Korea’s top export earner. Through November, the nation’s major semiconductor makers including Samsung and SK pulled in about $56.8 billion in revenues, the largest ever and about 10.9 percent of the nation’s total exports for the period." Furthermore, it noted that "The semiconductor business, which began in the early 1980s, earned Korea foreign exchanges that were used as seed money to develop advanced electronics industries, including smartphones and wireless communication devices. It was the No. 1 export business for 16 years, from 1992 to 2007, but started fluctuating in 2008 due to the global finance crisis.The reason that the business has thrived through the decades is because Samsung and SK won a series of games of chicken early on with global semiconductor makers, including NEC. Samsung Electronics has led the industry since the 1990s and SK became the world’s No. 2 after it made an average of 3 trillion won in annual investments since 2012. SK posted a record operating profit of 1.3 trillion won in the third quarter of this year. Today, the two Korean semiconductor giants control more than 60 percent of the global market share for all kinds of chips. But Korea can’t rest easy because the Chinese are coming. The Chinese government announced a plan of making more than 350 billion yuan ($56.6 billion) in revenues next year and to raise about 120 billion yuan in investments order to accomplish the goal."